Safety is a value and expectation at MedFlight. MedFlight partners have a right to a safe and healthful work environment, and all partners share the responsibility of working and acting in a safe manner. MedFlight and Metro Aviation maintain safety practices to protect the well-being of not only MedFlight partners, but your patient as well. We operate in a no-pressure environment: All members of the assigned transport team must agree to accept the mission before moving forward. This includes the clinical team, our communications center, the pilot or driver, and Metro Aviation’s operational control center if helicopter transport is included. This, and many other safety initiatives, are supported by a comprehensive Safety Management System. 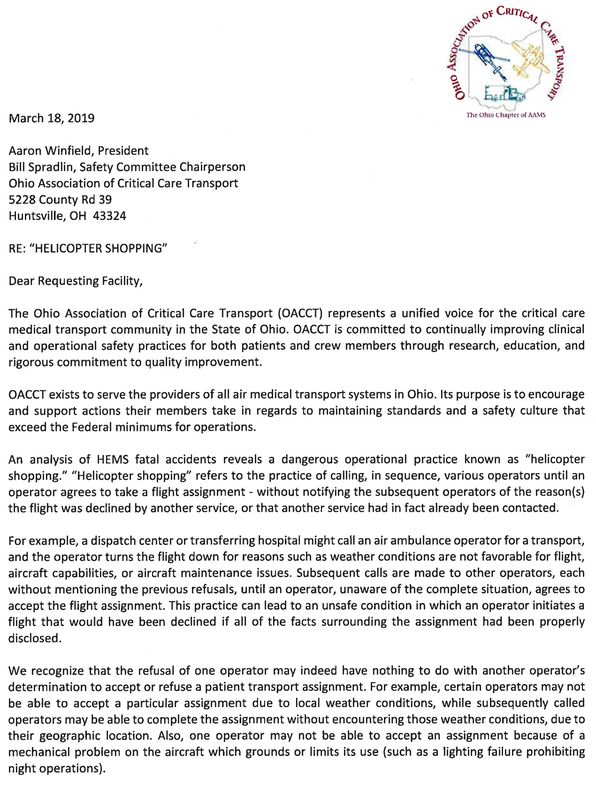 Communication within our organization, with the requesting public service agency or hospital, the receiving hospital, and neighboring air medical services is paramount in elevating safety in the critical-care transport industry. Linda joined MedFlight in January 2008 and serves as MedFlight’s Vice President of Legal Affairs and Risk Management. She earned a Bachelor of Science degree from The Ohio State University College of Nursing and a Juris Doctor degree from Capital Law School. She has both clinical and administrative experience in healthcare, including critical care (trauma and cardiac), clinical research, risk management and hospital legal services. Amanda joined MedFlight in June 2006. Her role at MedFlight focuses on safety in the critical-care transport industry, disaster response and management, post-incident planning, internal and external safety training, and more. She also serves as an instructor on behalf of both FEMA & The Department of Homeland Security. Amanda has been an Advanced EMT in Ohio since 2002 and completed EMS training through Columbus State Community College. Karen’s nursing career has spanned more than 30 years, where she has served in medical/surgical, emergency, and infection control departments. She serves as MedFlight’s Exposure Control Liaison, focusing on infectious diseases, bioterrorism, hand hygiene, surgical site infection prevention, FMEA process improvement and training for clinical teams.